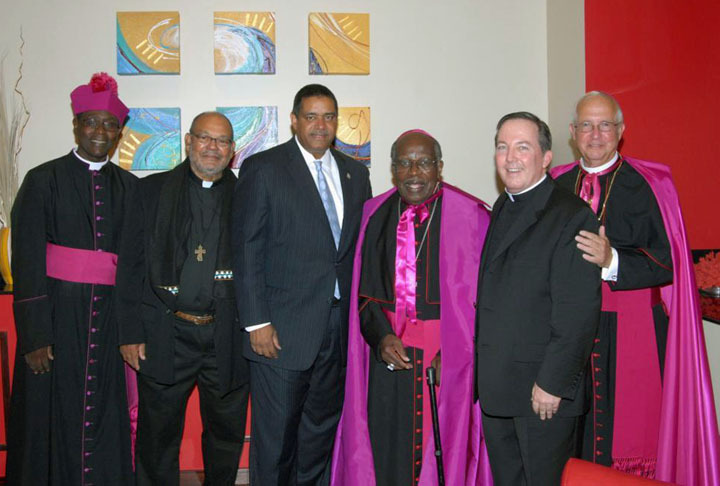 Bishop Elliott Thomas, a Redemptorist Oblate and bishop emeritus of the Diocese of St. Thomas in the U.S. Virgin Islands, was honored recently as the first recipient of the Keys & Sword Award. The award is given in recognition of extraordinary commitment and selfless dedication to the diocese. Redemptorists of the Baltimore Province began serving in the Virgin Islands in 1858, and served in St. Thomas until the late 20th century. Fr. Alfred Bradley, Baltimore vicar provincial, attended the awards dinner and offered a message of congratulations to the retired bishop. Fr. Bradley served for eight years as Bishop Thomas’ vicar general. The honor of Redemptorist Oblate is bestowed on individuals who have shown a deep commitment to the Redemptorists’ mission to the poor and most abandoned. We congratulate Bishop Thomas on his award and pray for his continued faithful service.